Quantifying surface/groundwater exchange – Zion Klos, Ph.D.
Seepage meters modified for use in flowing water were used to directly measure rates of exchange between surface and subsurface water in a gravel- and cobble bed river in western Pennsylvania, USA (Allegheny River, Qmean = 190 m3/s) and a sand- and gravel-bed river in Colorado, USA (South Platte River, Qmean = 9.7m3/s). Study reaches at the Allegheny River were located downstream from a dam. The bed was stable with moss, algae, and river grass present in many locations. 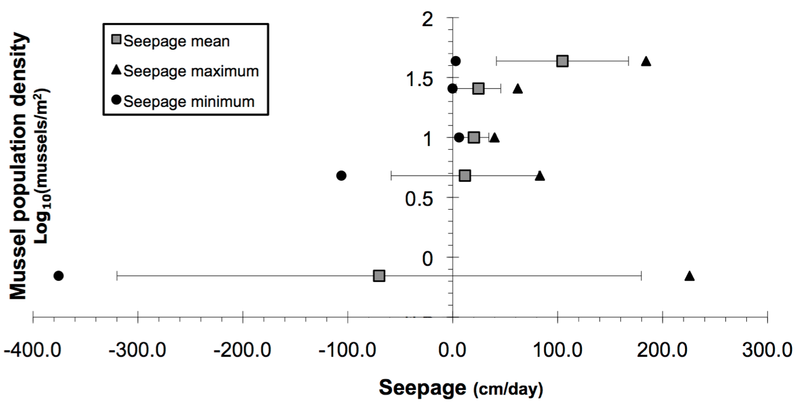 Median seepage was +0.28 m/d and seepage was highly variable among measurement locations. Upward and downward seepage greatly exceeded the median seepage rate, ranging from +2.26 (upward) to -3.76 (downward) m/d. At the South Platte River site, substantial local-scale bed topography as well as mobile bedforms resulted in spatial and temporal variability in seepage greatly in exceedence of the median groundwater discharge rate of 0.24 m/d. Both upward and downward seepage were recorded along every transect across the river with rates ranging from +2.37 to -3.40 m/d. Despite a stable bed, which commonly facilitates clogging by fine-grained or organic sediments, seepage rates at the Allegheny River were not reduced relative to those at the South Platte River. Seepage rate and direction depended primarily on measurement position relative to local- and meso-scale bed topography at both rivers. Hydraulic gradients were small at nearly all seepage-measurement locations and commonly were not a good indicator of seepage rate or direction. Therefore, measuring hydraulic gradient and hydraulic conductivity at in-stream piezometers may be misleading if used to determine seepage flux across the sediment-water interface. Such a method assumes that flow between the well screen and sediment-water interface is vertical, which appears to be a poor assumption in coarse-grained hyporheic settings. Copyright 2011 John Wiley & Sons, Ltd. Both endangered and non-endangered unionid mussels are heterogeneously distributed within the Allegheny River, Pennsylvania. Mussel populations vary from high to low density downstream of Kinzua Dam, and the direction, amount, and range of hyporheic exchange (seepage) at the sediment-water interface was suspected to influence their distribution and abundance. Nineteen hydrogeomorphic variables, including quantification of seepage metrics, substrate size, river stage, river discharge, and shear stress, were measured at 5 reaches on the Allegheny River within 80 km downstream of Kinzua Dam. Analysis revealed significant (a= 0.05) non-linear correlations between mussel population density and directional mean seepage (positive relationship), river width (positive relationship), and median substrate size (negative relationship). Specifically, seepage findings showed that increases in upward seepage and decreases in the overall range of seepage related to increases in mussel population density. River width, directional mean seepage, and median substrate size were also found to co-vary with marginal significance (a= 0.1), making their individual influences on mussel population density uncertain. Absolute mean seepage, water depth, hydraulic head, temperature differences between the surface water and substrate, and other substrate metrics besides median grain size were not found to significantly correlate to mussel population density. Considering the physical processes often linking seepage to other explanatory variables, future research in seepage-mussel relationships should work to isolate the mechanistic influence of hyporheic exchange independently from its common covariation with substrate size and geomorphology.